This is plate 34 from William Hodges' book 'Select Views in India'. Located at a crossing point on the river Gomti, Jaunpur was founded by Feroz Shah Tugluq in the 14th century. 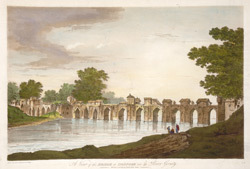 The massive Akbari Bridge, a remarkable structure with fifteen arches, was built between 1564 and 1568 by Munim Khan, the local governor under Mughal Emperor Akbar. Hodges wrote: "The inoundations have been frequently known to rise even over the bridge insomuch that in the year 1774 a whole brigade of the British forces was passed over it in boats."